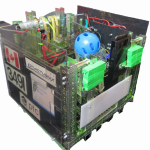 British Columbia is introducing Leagues for the 2017/18 FIRST Tech Challenge season. It means that your team will get more opportunities to play matches with your robot. All teams are encouraged to participate in League events which will be held in November, January and February. The scores from the League events will carry forward to the British Columbia Championships which will be held in February. At each League event, teams will play up to 5 matches. Scores from a maximum of 10 matches will carry forward to the Championships. Why are we introducing Leagues? Teams may play more than ten matches in League play, but no team will have results from more than ten matches included in the team rankings at the start of the Championships. It’s always a good idea to have your Engineering Notebook with your team, but you only need to hand in your Engineering Notebook for judging at the Championships. If my team misses a League event, can we still compete in the Championships?